Want to keep your lawn immaculate as possible? Maybe your lawn needs some more grass seed or you’re trying to fertilize a large lawn. Taking care of your yard requires a lot of hard work. The best drop spreader makes your life easier. These handy gardening and landscaping tools distribute fertilizer, seed and feed mixtures, grass seed, ice melt, and sand. A drop spreader or hopper works just like you’d imagine. As you push the spreader along, seeds or fertilizer is dropped via the holes at the bottom of the hopper. There are different sizes to most spreaders, but with these types, you only cover the area that you cross, which is different from a broadcast spreader. These cover larger areas in a shorter amount of time, but they also drop seed where you don’t want it to go. What is the best drop spreaders in April 2019? What is a Drop Spreader vs Broadcast Spreader? Within this group, there are certain hoppers that stand out due to their value, capacity, frame, spread pattern, and size. 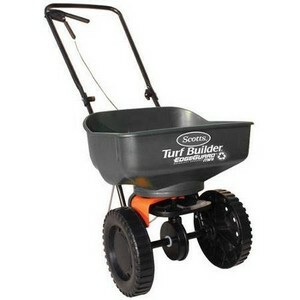 The Scotts Turf Builder is a classic hopper that gets the job done. Available in a variety of different sizes, owners cover about 10,000 square feet with the 10-meter edition. However, the tool is also available in 5, 15, or 20 meter sizes. The great thing about this turf builder is that you get the maximum coverage and accuracy for your lawn, and it’s a rather simple build that comes fully assembled. The materials are not incredibly fancy, but they are heavy-duty and stand up to the test of time. With a 22-inch spread coverage, lawn lovers feel confident working a yard where every inch is getting equal seeds and fertilization. This is different than with a broadcast spreader or hand-held broadcast, as it covers a medium-sized area with a precise application. 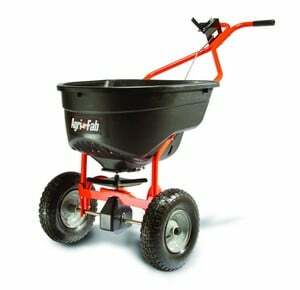 Although advertised mainly for feed and seed, this spreader is actually perfect for salting the lawn as well. It’s also been used for spreading anti-pest pellets, like fire-ant repellant. This tool uses a side blocker to control the hopper from spreading out from the sides. 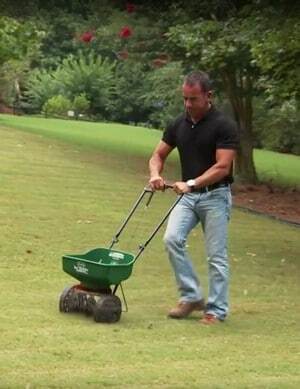 This spreader is an absolute fit for homeowners who have small to medium-sized lawns. It’s best used for fertilization, but the Turf Builder works with any material. 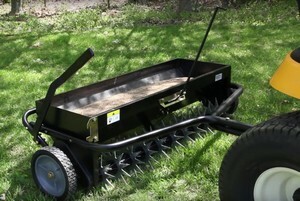 These hoppers spread seed on your lawn from spring to fall with this broadcast spreader. It is a larger capacity broadcast spreader, but whether you are a professional or not, the special features for this hopper make it a great buy for those who love their lawns. This tow-behind spreader comes with an on/off accessible switch from tractor seat for easy use. It’s sometimes difficult to get a precise application, but Agri-Fab comes with controls that easily lets you get a precise application. Due to the large spread area, you may feel like you are covering too much ground at times, so it’s important to use these controls. The poly hopper and spreader plates are also rustproof. 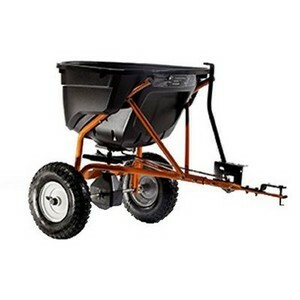 Landscapers typically keep this spreader around for many years without losing any durability. Agri-Fab also provides a guide of how to keep your lawn fertilized and thick throughout the year, so you know exactly when to spread herbicide, nitrogen fertilizers, grub controls, and other lawn care products. This allows you to spread any material with this heavy-duty hopper. As a tow-behind, this is a good spreader if you have a ride-along lawn mower.If you want something that’s going to work in summer, spring, fall, and winter, this is the best hopper due to the amount of features and heavy-duty construction. This is best for professionals or those who have larger lawns who plan to use it for each stage of lawn maintenance. ScottsBlue makes a variety of different hoppers. The EdgeGuard mini is the easiest to push because of its small size and lightweight construction. While you won’t want to use this with a larger lawn or for professional use, this may be the perfect value for someone who just has a small area that they want to keep fertilized through the year. In that way, the EdgeGuard has a lot of benefits for a homeowner or gardener who just wants to quickly spread some fertilizer. Even in its miniature form, the EdgeGuard comes with controls that let you control how precisely you drop seed. The handles and spreader bucket are pretty heavy-duty, but you likely won’t be able to use this spreader for salting during winter months. This is strictly a fertilizer spreader to use during spring, summer, and fall. The EdgeGuard is a perfect companion for someone who just wants to get started with fertilization and doesn’t have a large yard to cover. Most tow-behind broadcast spreaders are a little awkward and hard to use for the average lawnscaper. However, the Brinly AS-50BH is designed to be a low-to-ground tow-behind that works with your ride-along mower. You will be able to take care of any fertilization or material coverage with this hopper due to its construction and controls. For the price, you should be able to spread whatever you want. The aeration is an incredible feature that you don’t get with other spreaders, which is why the cost is bearable if you have a thick lawn that needs to be fertilized multiple times per month. With the 2-in-1 value, you won’t need to buy other tools to aerate or salt your lawn during colder months. This is a heavy-duty hopper that also holds a lot of material. The hopper contains up to 120 pounds of any spread material, which means that you don’t have to refill even if you have a larger lawn. The spread is over 40 inches and allows you to use the controls for a more precise coverage. As it perforates the ground, seed is dropped into the fresh soil. If you have a tougher terrain, this is a top pick just for this feature because it will place the seed directly into the soil. This tow-behind Brinly is perfect for those who live climates with tougher soil. With aeration and 8-inch galvanized spikes, landscapers use this aerating lawn care tool to really dig into the soil without tearing up the lawn. This features allow you to place materials like lime or fertilizer directly where it needs to go. Your average lawn maintenance doesn’t require such a big hopper. You want something that is going to spread seed in a precise manner for an even fertilization across your lawn. The Agri-Fab 4500462 is perfect for that. It’s also a good choice for professionals who are doing residential or commercial lawn care as long as you aren’t using a ride-along mower. This 130-pound hopper has a higher capacity, so you’re able to carry more feed and spread it across a large lawn. It has a solid rod gate control, enclosed taper and bevel gear box, and pneumatic tires. These make the hopper a great buy for those who do year-round lawn care and want to use a variety of different materials, from fertilization to lime to salt. The durability of this hopper can’t be complimented enough. For the size and spread, you can cover about a ½ acre or 25,000 square feet at a time. It’s the easiest way to get a lot of fertilizer into your yard without much effort. The one thing that you will have to remember is that you need to assemble this hopper. For the price, it should come pre-assembled, but the instructions are easy enough to follow and Agri-Fab also supplies a number of videos to help you if you get stuck. For those who have larger lawns and want year-round usage, this is a top choice for professionals and residential use. This spreader type covers a pretty large area and uses multiple materials making it the best choice for those who love their lawns. Buying a hopper is a big first step towards a beautiful lawn. It takes ongoing maintenance to ensure that lawns stay thick, lush, and green throughout the year, however it is made easier by those gadgets that have multiple functions and special features that give your lawn a better chance of staying green. While fertilization is the main point of any spreader, you want to be able to use the spreader for multiple materials because it allows you to keep busy and maintain your glorious lawn in any weather. Some of the drop spreaders on the list above have a variety of features, but which ones are the most important? We went through some of the things that you should look for in any hopper that you plan to purchase. With the emphasis on fertilization, we also look at some extra features that make a hopper a great all-around buy. This is one of the first things that we want to address as it’s important to our review of products below. First of all, not every drop spreader is going to have the same capacity and size. There is a big different between a hopper that maintains a house lawn compared to a large acreage lawn. In addition, we cover drop spreaders that are for residential and commercial use, so if you are a professional or DIY home landscaper, the hoppers help spread any material over your lawn. Drop spreaders by nature are meant to be pushed along a yard providing precise fertilization because it’s just in the areas that you cover. However, broadcast spreaders are much larger. They are meant to cover areas up to 25,000 square feet. These lawn care tools carry large quantities of materials so it’s perfect if you have to fertilize, lime, or treat a wide area, especially if you purchase a tow-behind broadcast spreader for a ride-along mower. 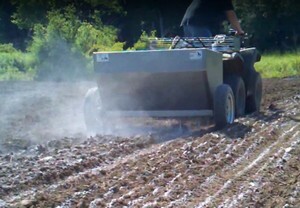 With a drop spreader, you prevent fertilizer or seeds from going where you don’t want them to go. This helps you create a beautiful lawn by purchasing a spreader that has the right capacity and convenience for your lawn care needs. While it’s not easy to tell the difference from a spreader that’s high quality and one that’s cheaply made, we have tested a variety of different lawn care tools and spotted the tools with the best options. Most drop spreaders measure capacity in pounds and feet. This means that when you see a 5-meter capacity with a 100-pound, that you will likely be able to cover 10,000 square feet. Every spreader should have this feature listed upfront as it is the most determining aspect. You will want a smaller spreader if you have a small lawn or garden to maintain as opposed to a larger acreage property that may require a tow-behind spreader. The different in a typical drop spreader and broadcast spreader is also the capacity. Broadcast spreaders are going to have much larger spreads because they are meant to handle lots of acreage and typically are tow-behind types. Drop spreaders are push hoppers that work best to fertilize a small to medium lawn. Professionals typically look for 100-pound or more capacity, especially if working in the commercial space. You will likely see 130-pound or more capacity spreaders in this range. Since cutting lawns throughout the year produces a lot of wet grass, you want to make sure that you have a spreader with rustproofing. This means a heavy-duty construction with galvanized steel parts that withstand rust throughout every season. If you plan to use your spreader to fertilize in every season, you don’t want it to start falling apart after the first year. Some of these spreaders cost a pretty penny so it’s worth it to have a tool that is protected against the elements. This is an added benefit for those who want to use a tow-behind hopper. You will be able to get a lot of mileage out of these hoppers because they make it easier to fertilize large lawns. While they are a bit more expensive, aerating the lawn is an important step to ensuring that fertilizer gets deep in your soil. This is especially true if you live in a climate with tougher terrain that is difficult to penetrate. 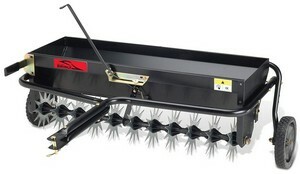 Aerating spreaders will typically have galvanized spikes that will perforate the lawn’s surface for you, making it easier to drop in lime, fertilizer, and seeds directly where you want it to go. Precision is important for a drop spreader. If you have a push spreader, then you know exactly where the seed is going to go. You also control the output with different knobs and selections. If you want a higher spread coverage, you simply need to set your hopper to a 3 or 4 to disperse the way you would like. Broadcast spreaders are known for not being as precise because you may not see where the fertilizer is going as you are likely in a ride-along mower with a tow-behind hopper. However, you use controls to set the output so that you aren’t doubling over with fertilizer in some areas. 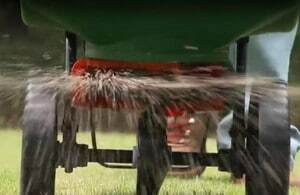 You may want to watch some videos or practice using a tow-behind spreader before trying to fertilize your whole lawn. Typically, tires are an overlooked thought in hopper construction. Cheaper spreaders won’t have tires that go over bumps or make it easier during snowy months. You want a hopper that is going to allow you to take on any lawn and climate. Pneumatic, heavy-duty tires are best for this application because the hopper easily moves over your lawn without getting stuck in rough patches because the grass is too thick or there is a dip in the lawn. This is the way that most broadcast spreaders are designed now. The combination of a tow-behind hopper and sitting mower or four-wheeler is that you cna cover the area quickly, get the job done, and then move on to the next project. While they are larger and more expensive, they are the perfect companion to those who have to coverage a large acreage or who own a professional landscaping company. Typically, a tow-behind spreader will be low-to-ground and have a much larger capacity. There are some accessories that you should possibly purchase if you plan to use the hopper professionally or just want to do the best job that you can. Are they necessary to keep the health of your lawn? Not exactly, but it’s worth it to have a spread cover so that your materials don’t spill out. Most of the cheap hoppers won’t come with any guarantees or warranties, but the heavy-duty, year-round spreaders will have at least a one-year or two-year warranty to ensure that you don’t have issues with poorly manufactured parts or rust. Ultimately, the right spreader for your lawn is going to depend on size, material, and seasonal use. You want a spreader that is going to be a year-round helper for spreading fertilizer, but you may also want to use it to spread anti-pest pellets, weed killer, salt, or lime. 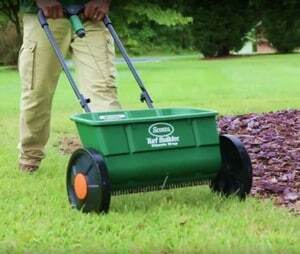 For general at-home lawn care and even professional residential landscaping companies, the Scotts Turf Builder Classic Drop Spreader is a great buy because it offers a large capacity that covers 10,000 square feet, but it’s also got a heavy-duty construction and a 22-inch spread pattern. This is a pretty great value. However, if you are looking for something a bit larger and need a professional tow-behind spreader, the Agri-Fab 45-0463 130-pound tow-behind broadcast spreader is your best bet. This is going to give you the maximum coverage and precise control that you are looking for without spending too much for other features like aeration. These drop spreaders have the best features in our minds, but what have you found in your search? Do you agree with the top features listed here? Tell us what you think about your drop spreader and what’s most important by sending feedback. I never thought to use the Scotts Turf Builder or products similar to it to spread seed on my lawn. I recently have an infestation throughout my yard and have been trying to figure out how to spread the repellent in a safe and easy way. This will definitely do the trick. 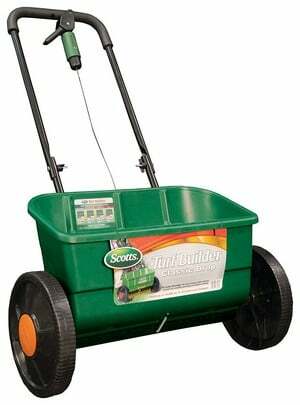 Gosh, the Scotts Turf Builder EdgeGuard Mini would be the perfect spreader for me if only it could spread salt for the winter! I don’t have really any space to hold two separate spreaders. Do you know of any alternatives? Yeah, my yard is way too large to just use a push spreader on it. Is the Agri-Fab 45-0463 able to attach to like a four-wheeler or something? I don’t want to kill all my grass with my truck.